The most amazing money saving tips EVER! Oooh, hello love it! magazine! You are looking classy as ever, I see, with your v. special blend of apocalyptic/bawdy real-life tales. And all of it for peanuts! This is one of the many magazines that Sue (my lovely next door neighbour) dropped round recently. 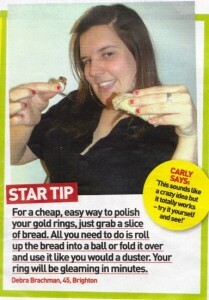 I have kept it by, because the regular “top tips” page in this issue has, quite frankly, surpassed itself. If you think that you have seen just about every money saving tip going, think again. If you can’t bear to chuck your stinky old flip-flops and you don’t mind having grimy footprints up your walls, this is the tip for you. Otherwise, I’d stick to rolled-up newspapers. There is the Good, the Bad and the Ugly; I guess the thrifty version would be the Frugal, the Cheap and the WTF? This offering slots neatly into the latter category. try cleaning gold with a toothbrush and toothpaste.